ShadeYou VPN Review 2019 – Is ShadeYou VPN Private and Secure? Mandee Rose | Posted on February 20, 2018 February 12, 2019 | Leave a comment on ShadeYou VPN Review 2019 – Is ShadeYou VPN Private and Secure? Today we’ll take a closer look at ShadeYou VPN (Virtual Private Network) to uncover the good, the bad, and the ugly. It has extremely attractive pricing, but does that mean you only get what you pay for? Is this service worth its salt, or is it another lemon in an industry swarming with competition? I’ll help answer these questions (and more) to help you make an informed decision before subscribing. First, let’s see the big picture by taking a look at ShadeYou VPN’s main strengths and weaknesses. How Much Does ShadeYou VPN Cost? For a little perspective, consider that the approximate average rate of other services is usually about $5.00 – $6.00 per month with an annual subscription. ExpressVPN, which is nearer the pricey end of the spectrum, costs $8.32 per month with an annual subscription. ShadeYou VPN costs even less than many low cost providers, like PIA VPN, which costs $3.33 per month with an annual subscription. Usually I recommend that people stay away from the monthly plans, since they tend to be more expensive and don’t offer any savings discounts. However, ShadeYou VPN’s monthly plans are so affordable that if you only want a one-month plan, it won’t cost you too much at all. In fact, even the monthly Premium plan costs less than ExpressVPN’s lowest rate. However, I don’t really see a lot of value in the annual subscription plan for the Standard package. It only costs $2.00 less per year than the annual Premium package, so at that price, you might as well splurge and spend a whopping two extra dollars for the improved service. Also, note that paid subscribers get a seven-day money-back guarantee, so it’s risk-free for a week. ShadeYou VPN provides a free trial in addition to its seven-day money-back guarantee, although I didn’t like the fact that the free trial only lasts for 24 hours. 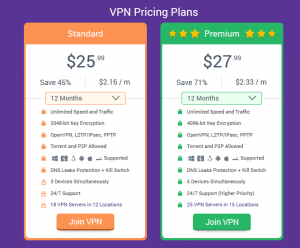 A few other providers actually have a free VPN service, but the free version is usually encumbered with restrictions like monthly data caps. These types of free services are great if you only need a short term solution, such as unblocking streaming multimedia content when you’re abroad for work or holiday. ShadeYou doesn’t have such a service. Instead, the free trial really only serves as a way to test out the VPN tunnel. There are some great advantages to the free trial, though. First of all, signing up is a fast, easy, and simple process. You hardly need to supply any information at all. The web form only requires you to enter your desired username, password, and email address. Some other free trials employ a marketing gimmick, by forcing users to enter payment card data or a credit card number. Then, if the user forgets to cancel the free trial, they are automatically billed. I personally despise organizations that use that tactic, since it’s a pain to try to get your money back if you don’t want to keep using the service. But ShadeYou seems to be a legitimate and trustworthy provider. The process of signing up for the free trial was fast (it took me less than a minute), painless, and easy. After you’ve entered your data, you’ll receive an email with an activation link. Simply log in and download the client. Unfortunately, even though the service works on just about every operating system you can imagine (due mainly to its use of OpenVPN connections), the ShadeYou VPN client only works on Windows systems. ShadeYou has decent features, though it lacks anything that really impressed me. I suppose the old saying is true and you really do get what you pay for. If all you’re after is a solid VPN connection, and you don’t want extra goodies like a proxy service, Smart DNS, browser extensions and so on, ShadeYou is shaping up to be a good option. I was very pleased to see that the software interface displays how many days are left on your subscription. I think every VPN service should display that information, because it makes it a lot easier to manage your subscription. Other than that, there’s not much else on the main pane of the software interface. Of these features, I was really impressed with the 2048-bit key length. Most other services will only offer keys that are 256 bits in length or less, due to the use of AES-256 (Advanced Encryption Standard) encryption. So even though this service doesn’t have a ton of features, I have to give it an A+ with regards to security. 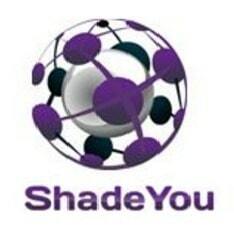 I also thought that ShadeYou VPN’s global network of servers was rather pitiful. It only has servers in 15 countries, which isn’t anything to write home about. For comparison, know that HMA VPN has servers in over 190 countries, and ExpressVPN has servers in 97 countries. Even other cheap services, such as PIA VPN, have servers in 25+ countries. So if you need to connect to a smaller country that’s off the beaten path of the internet, you’re out of luck. To be fair, its servers are based in the most popular geographic areas, like the US, Canada, UK, Hong Kong, and Singapore. However, I really wasn’t too impressed with ShadeYou’s connection options. The speed test that I conducted for this ShadeYou VPN review was rather encouraging. Because the service is priced so low and fairly minimalistic, I expected the speeds to be poor. However, they were above average. My Internet Service Provider (ISP) quoted that the connection speed is 100Mbps download and 50Mbps upload. In reality, many ISP connections will be slightly faster or slightly slower, depending on a multitude of factors ranging from physics to network configurations. Furthermore, my connection to the internet through my ISP may be decent, but remember that my data has to cross a lot of geographic borders and flow through a lot of different networks. Often I find that my bandwidth varies from country to country, which could be influenced by factors such as data transmissions policing. Interestingly enough, sometimes using a VPN tunnel will actually speed up your connection, since the tunnel hides the type of traffic you’re sending, which helps circumvent Quality of Service (QoS) and other configurations that limit the rate of your traffic. For that reason, I tested two different servers in two different geographic regions. The raw speed test results didn’t come anywhere near my quoted speeds when connecting to foreign speed test servers. But something interesting happened. When I connected to Hong Kong with the VPN tunnel, my download speed dropped by an insignificant margin, my upload speed improved a little bit, and my latency dropped significantly. In the US tests, my latency increased a tiny bit, while my download rate was choked by about 3 Mbps. However, I lost nearly 60% of my upload rate. I care most about my download rate, and in both tests, the download rate was more or less preserved through the VPN tunnel. ShadeYou may not be the fastest VPN service (far from it), but I was reasonably pleased with its speeds. I didn’t really like the ShadeYou customer service. Usually (but not always) services that are as inexpensive as ShadeYou VPN have limited customer service. I felt tricked a little bit on the website. I went to click on the live chat feature to pester support staff with questions to see how knowledgeable they are, but there is no live chat feature. Instead, all I got was a little pop up window that displayed a web form. You can enter your email address and a message into the form, and the website will send an email to the support staff. Support is reachable 24/7, but I wish there were more ways to contact the support department. Interestingly enough, the support section of the website includes real-time network status reports. The data will show you how busy any given server is, expressed as a percentage of total capacity. I absolutely love it when VPN services provide customers with this information, and it’s useful for ruling out a busy server if your connection is running a little slow. I was a little skeptical of this provider, given that its national origin is unclear. It seems to be a Ukrainian-based service; however, it’s actually registered in the Netherlands. As far as I know, I’ve never used a service or interacted with a business that’s from Ukraine. I do see a massive benefit of being registered in the Netherlands, though. I typically distrust services that are based in the US, as well as FiveEyes countries, including the UK. The US simply practices too many surveillance techniques in the name of thwarting global terrorism. So using a service that is based in the Netherlands helps ward off subpoenas and warrants from the US government, as it prevents scenarios where authorities demand sensitive information. Should I Use ShadeYou VPN? ShadeYou VPN is a low cost provider that seems to have designed its service to be simple and easy to use. It doesn’t come with a lot of extra features, and instead has a rather basic yet streamlined service. As far as speed is concerned, I do wish the connection was running a little faster, but overhead is to be expected with any VPN service. Overall, ShadeYou exceeded my low expectations. I tend to associate price with quality, and thought that since this service is so cheap that it would be terrible. That didn’t turn out to be the case, though. I would definitely recommend this service to anyone who wants a low cost VPN. There are certainly many better VPNs, with more features and faster speeds, but with those benefits comes a heftier price tag. If you’re curious about using the service after reading my ShadeYou VPN review, I highly encourage you to sign up for the free trial!